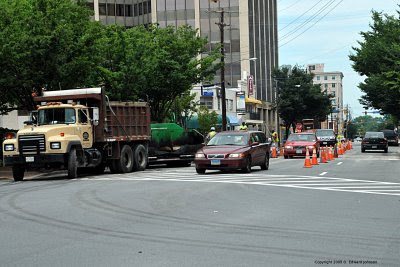 They have been doing on-again off-again road work on Woodmont Ave next to Veteran's Park in Bethesda, MD for a while, a couple of months ago they were digging it up to install an underground pipe across it. 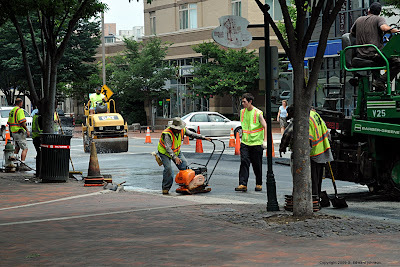 It looks like they are finished for good because today they were re-paving that area. They had closed one side of the street and had some cones set up so there was one lane in each direction available. Traffic is light enough at this time of day that it wasn't causing much of a backup, though not quite everyone got through the light cycle every time. Around 1:15 they had finished the verterans park side and were taking a break. Since the other side of the road was already ground down, I bet the tackle that this afternoon. Update 9:30pm: I checked this evening and they did finish paving both sides of the road.